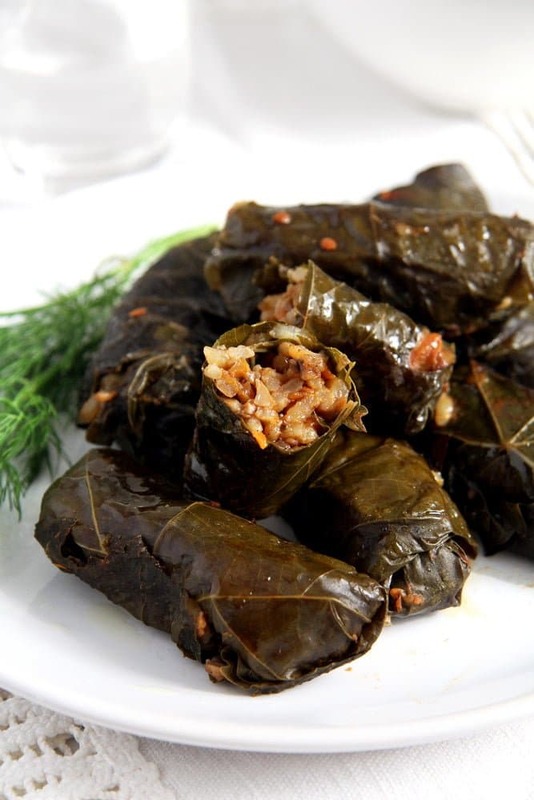 Vegan vine leaf rolls stuffed with rice and mushrooms and cooked in an aromatic tomato broth. I am really into stuffed vine leaves lately. 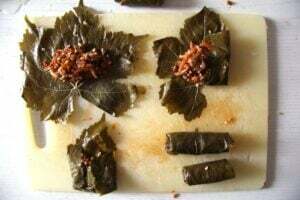 The reason for that is that I bought two rather large jars of vine leaves quite a while ago when making these wonderful Syrian Stuffed Vine Leaves with Rice Garlic and Herbs. I used one of the jars for making a huge portion of the Syrian rice rolls, but I still had that other jar gathering dust in the cellar. So, I decided it was time to use it up. But because I did not want to make such a huge portion of only one type of stuffed vine leaves, I manage to get 3 recipes out of only one jar of leaves. Of course, I took pictures of all of those vine leaves rolls and I intend to publish those recipes sometime at the beginning of next year. 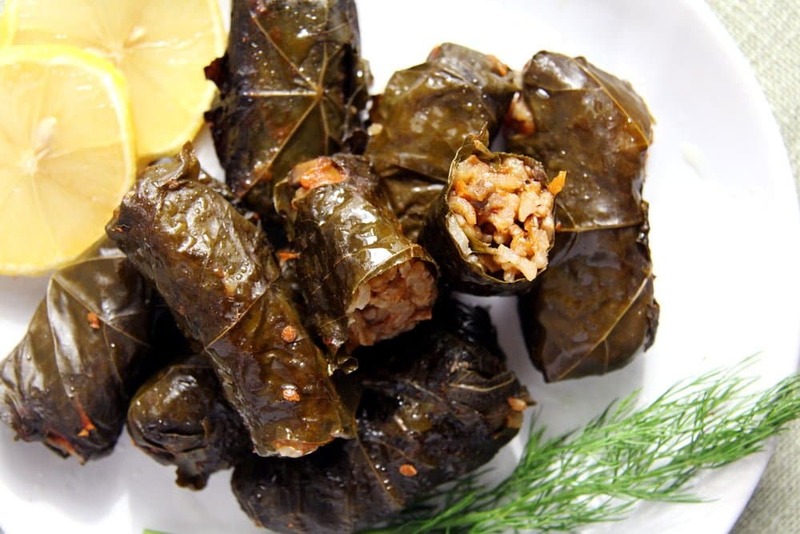 But until then, I will give you one first taste of these wonderful stuffed vine leaf rolls filled with rice and mushrooms. This is actually much easier than you might think. OK, you do have to take a bit of time and sit down to make those rolls, but after making 3 or 4 of them, you will get the hang of it and things will go pretty quickly. Start by bringing a large pot of water to a boil and boiling the leaves for 3 or 4 minutes. Some might say that this pre-cooking of the leaves is not really necessary. 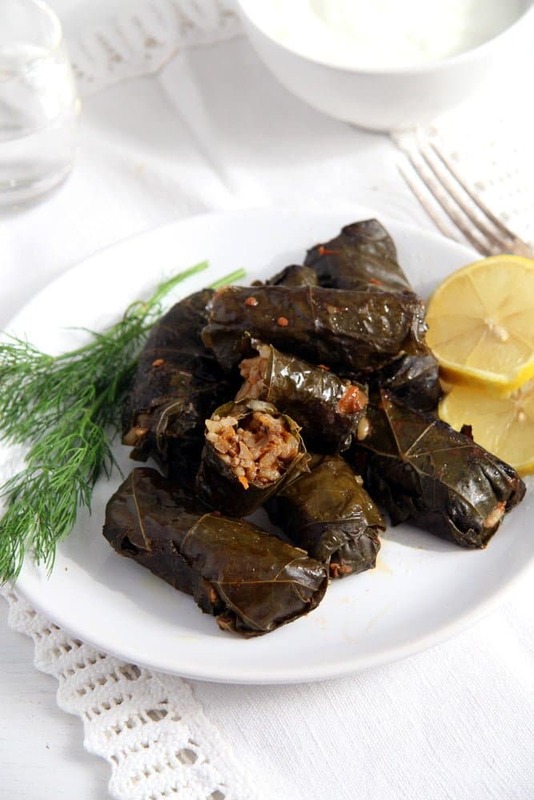 However, my grandmother always did that, my Syrian friend who gave the recipe for the Syrian Stuffed Vine Leaves does it as well and the only time I didn’t do that I found the vine leaves a bit too rough. It is up to you though, it might also depend on the brand of vine leaves you are using. There are two ways of rolling the leaves, the one I have learned from my grandmother and the one I have learned more recently. Both ways are very easy and they both work very well, there will be no need to tie the rolls with yarn or to stick a tooth pick in the rolls to make them hold together. 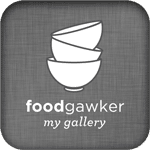 I am mentioning that because I have seen many recipes for stuffed cabbage rolls or vine leaves suggesting that one might do that in case the actual rolling won’t work. I can tell you that I would give up making stuffed cabbage/vine leaves altogether if I had to tie each roll and then untie it at the table. So, the two methods are pretty similar, the only difference being in the way you close the roll. My grandmother used to place the filling somewhere in the lower part of the leaf, fold the lower part of the leaf over the filling, then fold the right side of the leaf over the filling. Then she would close the rolls with her index finger by tucking the left side of the leaf into the already formed roll. The second method: place the filling somewhere in the middle-lower part of the leaf, fold the lower part of the leaf over the filling, then fold both the right and the left side of the leaf over the filling and make the roll. Both methods work well for both cabbage and vine leaves, but I prefer to use the first method when rolling the sturdier cabbage leaves and the second method for the delicate vine leaves, I think the chance of breaking the leaves when tucking them in is higher when stuffing the vine leaves. However, you can try both methods and choose the one you feel more comfortable with. One thing to keep in mind is to not over stuff the rolls, if you have too much filling the rolls will probably open during the cooking process. About 1-2 teaspoons filling for a medium vine leaf should do. You will notice if you have too much filling, you will not be able to form the roll properly. This recipe makes approximately 40 rolls, however you will need more than 40 leaves, I always count about 10-15 more leaves than I actually think I need. 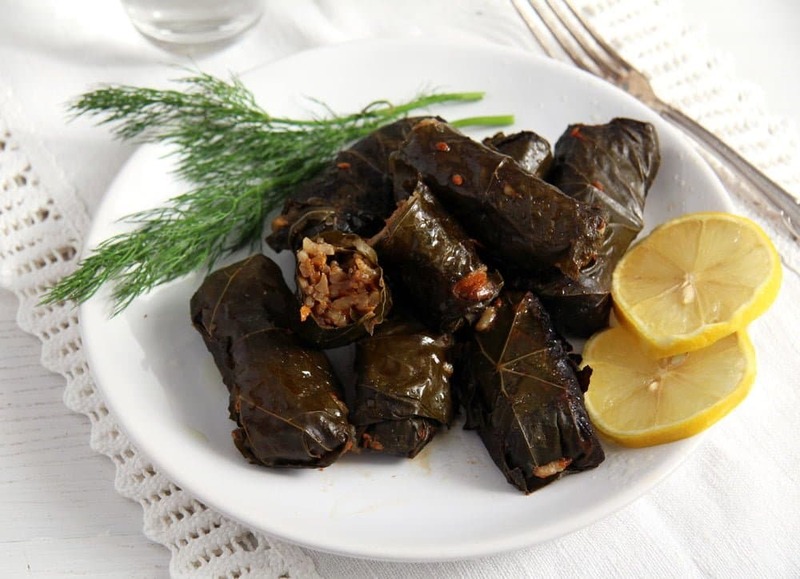 The problem is that you will never ever find of jar of vine leaves where every single leaf is perfect. Some will be too small to fill and some will be broken. That is normal, don’t worry about it. You do not have to throw those small or broken leaves away, just put two of them together to form one roll. 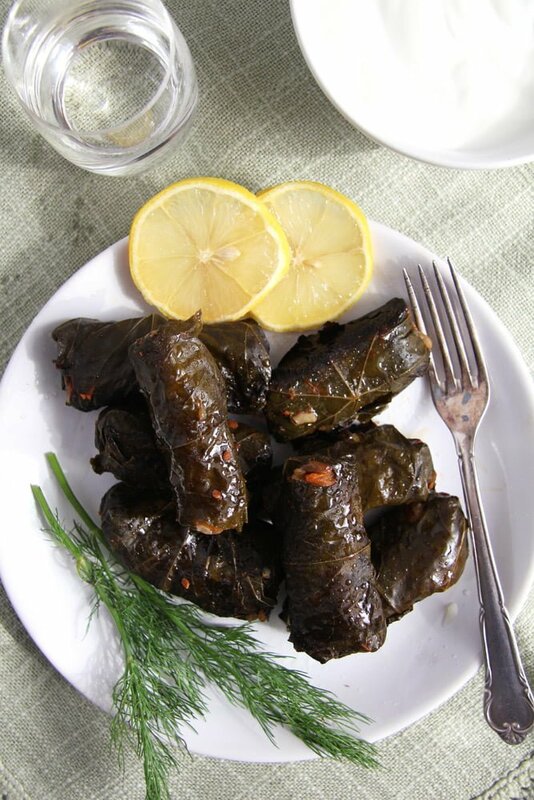 And I am talking about 40 rolls, but you might only get 30 or maybe 50 out of this recipe, it really depends very much on the size of the vine leaves. Another important thing when making stuffed vine leaves is to really spice the filling well, I had my own experiences with bland fillings and bland cooking broth and trust me, you do not want that on your plate after so much work. So make sure to adjust the taste very well with salt and pepper and be generous with all the spices as well. Many people cook the leaves in plain water, but I was never happy with that. I use water alone when making rolls stuffed with meat, the meat will give the rolls enough taste, but that will not work when using only rice and vegetables. That is why I recommend using a very good vegetable broth or if you don’t care about keeping the meal vegetarian/ vegan you should best use a very good (homemade) chicken stock. You can serve them hot as a main meal with tomato sauce or yogurt sauce, 40 small rolls will feed about 4 to 6 people. Or you can serve them as a mezze, as part of a larger meal including other mezze. In this case they will definitely serve more than 4 people. Bring a pot of water to a boil. Add the vine leaves and let them simmer gently for about 3 or 4 minutes. Drain well and leave until cool enough to handle. In the meantime boil some water in a kettle. Place the rice in a heatproof bowl large enough to hold all the filling ingredients later. Pour the boiling water over the rice and let stand for about 5 minutes. Drain well. Give the rice back to the bowl. Chop the mushrooms very finely. Grate the carrots on the rough grater and the garlic cloves on the fine grater. Chop the onions very finely. Give the vegetables to the rice in the bowl. Add 2 tablespoons of the tomato paste, thyme, both paprika powders, chopped dill and parsley and olive oil. Adjust the taste very generously with salt, pepper and more of the spices, if necessary. Mix well. Start making the vine leaf rolls. Read above for more information on that. Place a vine leaf on the working surface. Add 1-2 teaspoons of the rice filling (depending on the size of your leaf) in the middle-lower part of the leaf. Fold the lower part of the vine leaf over the filling, fold the left and right sides of the leaf over the filling as well, then form a roll. Place the roll with the seam facing down in the cooking pot. Repeat until you have used all the filling, arranging the rolls nicely and tightly in the pot. Add the bay leaves and the black peppercorns between the vine leaf rolls. Mix the tomato passata (tomato puree) with about ½ cup of the vegetable broth and the remaining two tablespoons tomato paste. Pour this mixture into the pot. Add some extra vegetable broth or chicken stock to barely cover the rolls. Cover with a tight fitting lid and bring to a boil. Turn the heat down to a minimum and let simmer for 1 hour. Check one roll to see if the rice is done. If should be soft and a bit sticky. If it is not so yet, continue cooking for about another half an hour adding more vegetable broth or chicken stock if necessary. Check the rice again and continue cooking for another ¼ or so if the rice is not cooked yet, but 1 ½ hours should normally be enough. Serve the rolls with tomato sauce or yogurt sauce. 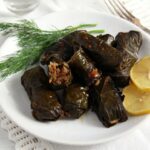 I love stuffed vine leaves so much! It’s one of my favourite snacks and I also put them on salads and bowls, whenever I buy some (still never made my owns!). Love that you added mushrooms and carrots here, it must be super delicious! They look gorgeous, Adina! 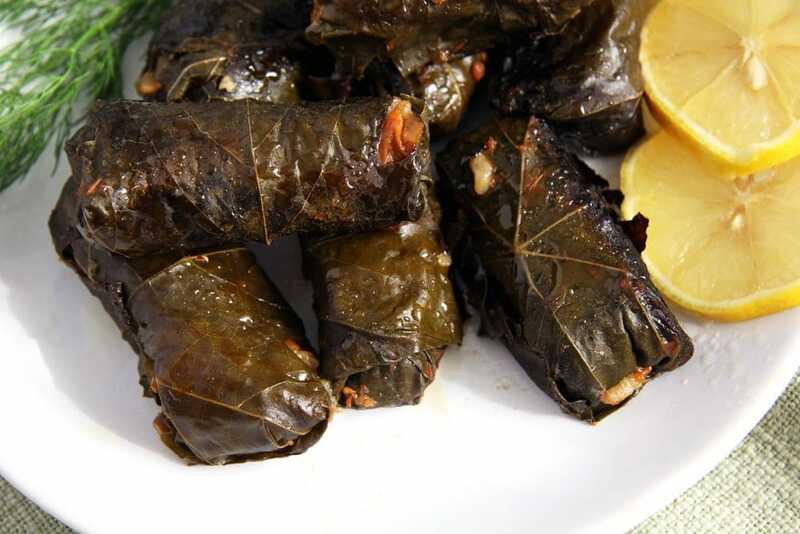 I do remember your Syrian vine leaf rolls actually ! I promised myself I would prepare them and then forgot…. thank you for reminding me I must buy vine leaves one day.